I estimated the brightness of T Pyx at magnitude 7.3 during the past 2 evenings. This is a bit on the bright side with most observers placing it between 7.3 and 7.6. T Pyx should continue to slowly brighten for the next few days before entering a phase of more rapid brightening that should ultimately bring it to a peak magnitude of ~6.3. 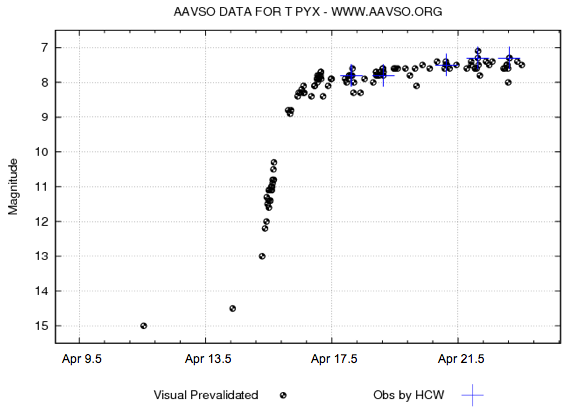 Visual magnitude estimates submitted to the AAVSO. My observations are denoted by the blue crosses. Plot produced with the AAVSO Variable Star Plotter. Credit: AAVSO.